Oakland Nursery is my favorite nursery destination, bar none, for buying plants. I have shopped there for the thirty years or so that I have gardened. Their project was to portray the movie, ‘Lord of the Rings’. 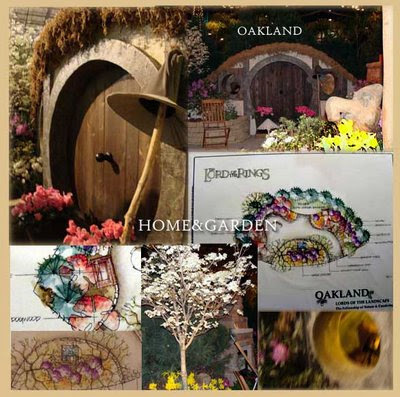 Choosing a Hobbit house in Baggin’s End they built an intimate feeling gardened place around the front entry to the home of Bilbo Baggins. Included was an outdoor fireplace, raised beds, and a chair for sitting in the sunshine…waiting for, oh I don’t know…. some wizard to come along.